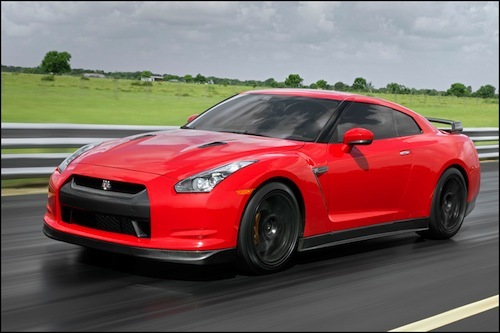 What would happen if you take a 2013 Nissan GT-R and give it a 1000 horsepower upgrade? Most sane people would say it would be crazy rediculous. But Hennessey Performance doesn’t do anything that is ever called sane. They can take a fast car and make it crazy fast. Hennessey Performance has just released information on a 2013 Nissan GT-R HPE1000 performance upgrade that will pump out a mind-numbing 1000 hp. Why did they do it? Because they can. John Hennessey doesn’t believe in doing anything average. He could take a Hugo and make it insanely fast. This is the performance shop out of Sealy, Texas that has been making “fast cars faster” since 1991. Hennessey Performance's (HPE) operates out of their 30,000 square foot facility that is located about 45 minutes west of Houston, Texas along Interstate 10. If you walk into their showroom, you’ll see some of the hottest cars on the planet that they custom build for their customers all over the world. The Hennessey HPE1000 2013 Nissan GT-R is their latest example of taking an already fast car and turning it into something insanely fast. That’s what this Texas performance shop is about. So they took an already fast 2013 Nissan GT-R with 543 horsepower from the factory and gave it some major tweaks and bumped up the performance to an incredible 1000 bhp. Nissan has just produced the hot 2014 Nissan GT-R NISMO, but it won’t come close to touching this new creation from Hennessey. Want to know what a 1000 hp GT-R will do in from zero to 60? How about a neck-snapping 2.4 seconds. Now that will get your blood pumping. That puts it on par with some of the fastest cars on the planet. The 2011 Bugatti Veyron 16.4 Super Sport has been clocked at 0-60 mph in 2.4 seconds and the 2009 Bugatti Veyron EB 16.4 also had a 0-60 mph sprint in 2.4 sec. That is some very good company and makes this Nissan GT-R with the Hennessey HPE1000 upgrade a scary fast performance car. Hennessey will take your GT-R and spend some quality time with it. They will add a few goodies and give it back to you ready to rock. The HPE1000 upgrade package includes a 4.0L Stroker Motor Upgrade, Stainless Steel Midpipe Exhaust, Ball Bearing Twin Turbo, Intercooler with Piping, and performance Fuel Pump System. Additional performance suspension and carbon fiber body panels are also available. In order to handle all that horspower, Hennessey adds a Clutch Pack Upgrade, Transmission Cooler Upgrade, Inlet Piping, Stainless Steel Blow-off Valves and Turbo Downpipes, and High-Flow Cold Air Induction and Fuel Injectors. They will professionally install all these goodies and then run your car on their chassis dyno. If it all looks good, they take the car out to the test track and road test it before the customer ever takes delivery. The car will be a real sleeper and won’t look much different from a stock GT-R with the exception of two exterior badges strategically placed that will warn others this is an insane piece of machinery. If you have the inclination to have the hottest 2013 Nissan GT-R on the planet, call John at 979-885-1300 or email them at [email protected] for more information.